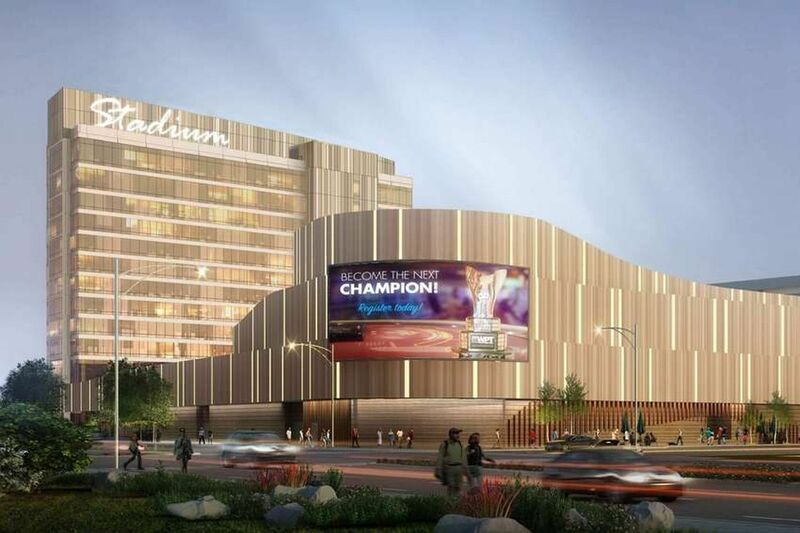 Stadium Casino on Packer Avenue, seen here in an artist's rendering, is one of three Pennsylvania casinos to apply for an interactive gaming license. The physical casino is scheduled to open in 2020, but it may be offering online betting before that. Three Pennsylvania casinos — Parx in Bensalem, Mt. Airy in the Poconos, and the yet-to-be-built Stadium Casino in South Philadelphia — applied Friday for the state's first interactive gaming licenses to offer online betting. Douglas Harbach, Pennsylvania Gaming Control Board spokesman, said the three casinos filed petitions Friday for $10 million licenses that would allow interactive gaming in three categories: peer-to-peer interactive games such as poker; non-peer-to-peer interactive table games; and interactive games that simulate slot machines. The state's 13 casino license holders have until Monday to apply for the licenses for all three categories of internet games. For a month after that, the 13 casinos have the option to apply for licenses for any individual interactive gaming categories at a cost of $4 million per license. If any of the licenses are unsold after Aug. 16, the gaming control board could offer them to qualified operators that do not have casino licenses. Online gambling, which was launched in New Jersey in late 2013, was legalized in Pennsylvania under broad gaming legislation passed in 2017. In both states, bettors must be using electronic devices located inside the state to participate. The casinos won’t be the first to offer online wagering in Pennsylvania. The Pennsylvania Lottery in May launched iLottery, allowing users to buy a chance to win cash from their smartphone, other mobile device, or computer.